Many builders, airtight installers and self-builders are doing slight mistakes when it comes to airtight sealing of windows and doors. Sometimes they do not seal the bottom of the window frame, because it will covered by the window board afterwards. Sometimes they install the tape not as recommended by the manufacturer. 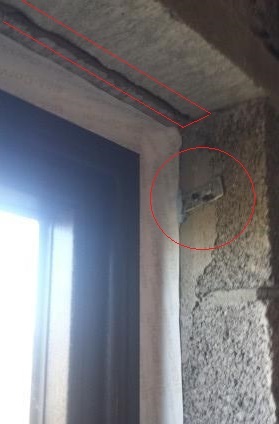 But the most common mistake is the missing taping of extending window fixings like straps or joints between the lintels. It´s definitely not good enough to tape just the half of the window straps. The last installer responded to my concern regarding the missing fully cover, that he used "a good portion of mastic on the strap as well". He didn´t understand the fact that he´s not able to seal the backside of the strap by doing the airtight sealing his way. Unfortunately the draughts will find their way through these leakages between the strap and the blockwork. That´s why I highly recommend to tape all window straps completely.